Often, when creating an advertising campaign, there is nothing better that catches the reader’s eye than good illustrative design. The goal of a good advertisement is to capture the viewer’s attention. After that, it needs to engage, inform, educate, create desire and finally to create action (whether this is an enquiry, behavioural change or simply a visit to the company’s website). It’s a proven formula. So, get the design right, grab the attention and the rest will flow. Of course, it is rare to design an effective advertisement without text although, an advert without words (or only a few at most) can be the most powerful of all marketing pieces. See some great examples of text-free, product-led advertising here. But, when it comes to advertising a company’s service(s), more often text is required. However, not all advertisements are billboard size (or even A4 size come to that) and so, when space is limited – for small scale digital advertising, for example – it is crucial that, if an illustration is utilised, the illustrators design it in a way that it works in harmony with the text and the available space. Otherwise, the advert will appear too busy and confusing. 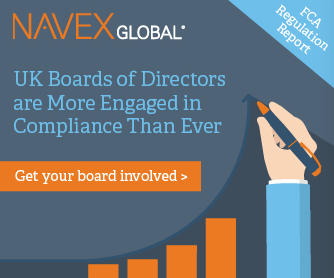 Recently, Design Inc were approached by international Ethics & Compliance specialists, NAVEX Global, to help establish a new creative style for their multi-language, digital advertising campaigns. These were required to introduce various products & solutions across a range of digital advert sizes. Many of them, of course, being a small size. NAVEX Global provides products, services, solutions and resources. From management reports on international bribery through to incident management software, all are pitched at a high-level corporate audience. Stage 1 in our advertisement process is always Investigation. We need to get under the skin of the company and learn a lot more about them and the project aims & goals. This included looking into company & brand values, client profile, market positioning, preferred messaging, existing research & assets, etc. And, once that was done, we were in a better position to establish a design brief which was shared and agreed with the client. Initially, several design routes were considered with one style clearly winning over the client. This was an illustrative design style which served not only to complement the text and the available space but also one which appeared corporate yet approachable, powerful yet flexible. Having agreed upon this creative route, the designers set to establish a series of illustrations, each of which would focus on one particular message (whether this be a specific company service or otherwise). In total, over 30 different illustrations were created. For some advertisements we allowed more text/information to the reader through the use of an animated gif, which would allow several slides to appear within the one advert space. For other ads, we were also able to add a link through to a dedicated landing page on the client’s website. This illustrative design style has been implemented throughout Europe and will continue to deliver results for some time to come. Should you wish to discuss your illustrative design and/or advertising requirements, contact us on 01784 410380 or send an email to our Client Services Director, Frank Norman.